Well, the day started out well enough. My dad had asked me if I wanted to go on the weekly tour given by the MN DOT of the new bridge being constructed to replace the bridge that collapsed last year. He picked me up and we drove downtown to join about 200 other people for the tour. More on this in my next post. They had been predicting rain all week, so I was pretty happy when the sun was still shining when I got home after the tour. The hedges surrounding my back yard were very over grown when I moved in. Right after I moved in, one of my tall friends cut them down for me to a more manageable height. I've been trying to maintain them at 5' to 6'. I'm 5'6". I pulled out my battery operated hedge trimmer and started trimming off all of the new growth. It has a safety button that you need to keep pushed in while the blade is in motion. I had gloves on but one of my hands started to get really hot, so I took one of the gloves off. On the very last swipe of the blade on the very last bush.....the blade hit my finger. Blood gushed. I went in to wash the wound and hope against hope that all it needed was a band-aid. The next three hours I spent in the urgent care room. Ever the diligent blogger, I took a photo while I was waiting on one of the rooms. But frankly it is a little too gory for even me to look at, so I'll spare you. I have a nice splice down the center of my left index finger through the nail and most of the skin came off like a little lid. The good news is that an x-ray showed I didn't break the bone, I am entirely up-to-date on my tetanus and my nail will grow back (I am a girl; this is important). The bad news is that on Monday I get to call a hand surgeon...I have stiches through my fingernail.....and my federal tax rebate will not be going to new storm windows. To add insult to injury, when I got home I had to haul that fricken hedge trimmer into the garage (it was supposed to storm) and clean up my own blood drips through the house. Right now it's hailing outside on my car. I don't care. (I'm pretty sure its the pain killers.) I've had a good cry (again the pain killers) and now I'm going to bed. At least the damn hedges are trimmed. I hope they are happy. 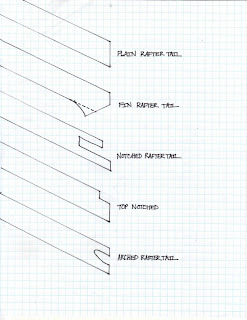 The big topic at StuccoHouse this month has been rafter tails. As a quick refresher, the rafter tails on my house were hacked off when aluminum soffits were added many years ago (hit the labels below for the full story). 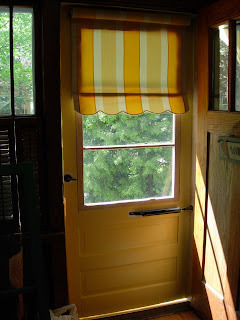 Last summer I pulled down all of the aluminum trim and have been oh-so-slowly restoring the original wood soffits, rafters, half-timbers and bargeboards. According to old photos, the house originally had plain rafter tails. I'm generally a bit of a restoration purist. If it wasn't part of this humble, working class bungalow to begin with, then it not going to be added now. No fancy-shmancy upgrades. I really, really, really want decorative rafter tails. Did I say really? I have spent the past few weeks driving & walking around my neighborhood. Between you and me, I'm a little surprised I haven't hit a parked car as I've been driving slowly down the blocks gawking at rafter tails. Approximately 20% of the houses have decorative rafter tails. Many others look like they once did and they were cut off due to decay or aluminum/vinyl trim (what were they thinking?). I'd say probably half of the houses originally had decorative rafter tails. It was kind of interesting. Bungalows on blocks that also had tudor houses were less likely to have decoration. But, there were whole blocks of bungalows were every house on the block had designed tails. I've added a drawing of the most popular designs I saw. I'm personally leaning towards the "fin" design. Keeping in mind that on the front of my house, because of the odd front door overhang, I only have a bargeboard (rafter) end on the right side. Going too fancy would seem like it would throw this off balance. It took me a while to figure out how the "fin" design worked. I finally ran across a house whose paint was peeling and I was able to see that the "fin" is actually a little piece of board that is added to the bottom of a regular rafter tail. I have 7 "tails" that need to be restored. I plan to leave the smaller "tails" over my buffet bump out plain. Every Spring I say a little "thank you" to the PPPO (previous, previous, previous owner) of StuccoHouse. 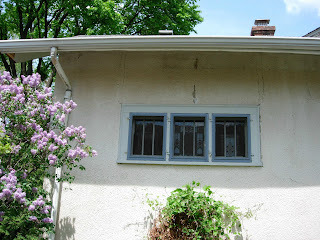 In a pure stroke of genius, he planted these three lilac trees next to these three casement windows. 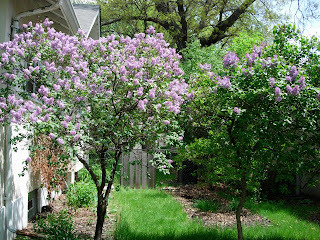 As I write this post, a nice breeze is blowing lilac scent into my livingroom. I'm sure he didn't intend it at the time, but those trees also do a nice job of covering an ugly downspout. 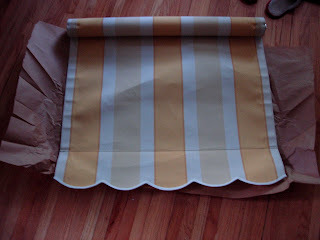 This afternoon I picked up the awning fabric, storm door shade that I ordered a few weeks ago. I like it. I spent most of the day putzing outside. It's the first really nice weekend we have had so far this year. If by nice you mean partly cloudy, windy and 70 degrees. 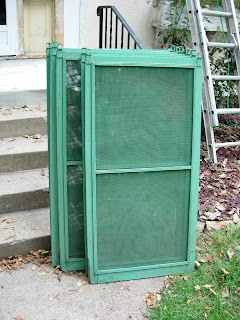 I pulled out my storms and put in the screen windows. 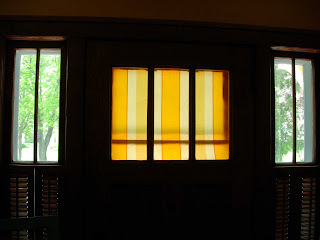 There are a few other houses on my block with vintage wood frame storms/screen and we all seem to choose the same weekend for the change out. I watch for the house on the corner down the street with the tulips...when they change, I change. I also finally made time to go down to the basement and measure the vintage screens I bought at a garage sale two years ago. As it turns out, two of them are an exact fit for windows on my house. So, I took off the old hanging hardware and painted them grey to match my existing storms. 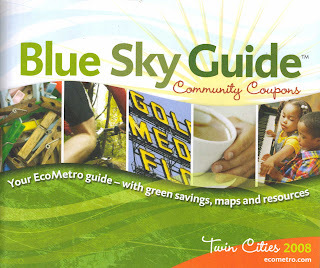 This past week I bought a Blue Sky Guide. It's a local coupon book that sells for $20. I buy one pretty much every year because it includes coupons for most of the hardware stores near me, the two grocery stores I go to, and the ReUse Center and ReStore. It also has coupons for my "can cheer me up even on the worst day" stores Patina and Bibelot. 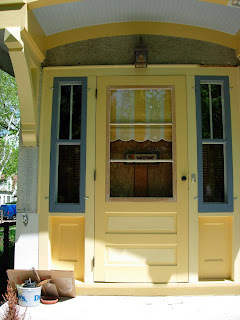 This summer I plan on looking for another salvaged wood storm door for the side of my house, and the ReUse Center coupon is for 20% off so that's about $10 right there. I figure I get about $50 worth of usable coupons, so it works out to be a good deal for me. Here's a sad sign of the times though. I got the book home and started paging through it only to find that someone had stolen a $1.00 coupon for gas out if it. Of course, the store that sold me the book gave me a replacement coupon. But, holy cow.....who has the brazen nerve to stand in a store and tear out a coupon? 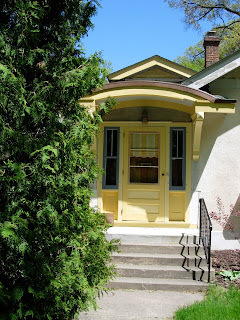 The Twin Cities Bungalow Club House Tour is this Saturday 10-5 pm. Details here. Permission to snoop through other people's vintage homes without fear of arrest. What's not to love about that?